Here he is, finished at last. 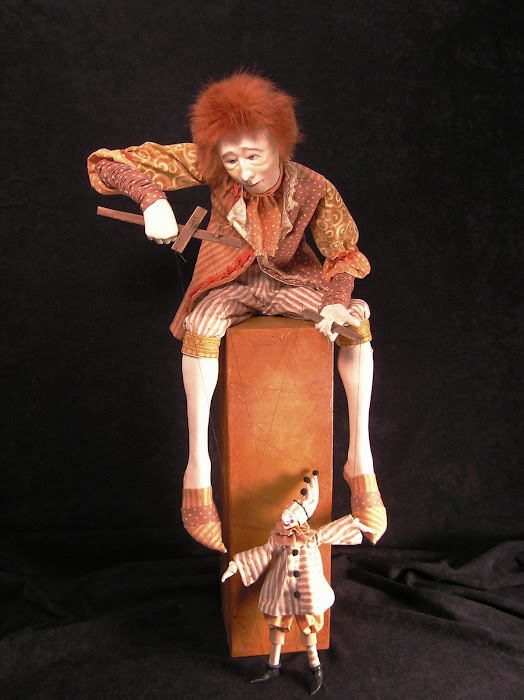 He stands about 8 inches high, one of the smaller pieces I've made. His head and hands are polymer clay. The bicorne hat is felt and rattail cord with an embellishment of torn fabric and a knot of ribbon. 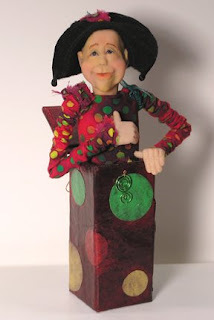 His box is papier mache, painted and glazed with acrylics to complement the fabric of his costume. I haven't named him, but Bonaparte comes to mind... something about the way his right hand is posed. Today I'll pack him and send him off to Atlanta. Happy travels little fella. I know you're going to love your new home! He is sooo cute! You make the neatest things! Marsha, I love this little guy. Glad to see your blog and hope you will post more. And I love your picture of you...what a cute little girl!